Are you curious about Yoga and how it can benefit you? You can come to us (see workshops below), or we can come to you! We offer free workshops at libraries, community centers, corporate workplaces - you name it! 6/14/18: FREE Yoga Workshop at the laflin library, laflin pa.
We had a great turnout at this event and met some wonderful new friends! Have you ever thought about taking a yoga class but didn't know what to expect? Are you curious as to how yoga can improve your health mentally, physically, and emotionally? Join local yoga instructors Lisa Galico and Pam Snyder for a Night of Yoga Education on Thursday, June 14th at the Laflin Library. During the FREE program, Lisa and Pam will present the many health benefits of yoga and discuss some of the common misconceptions associated with yoga. Beginner’s Yoga and Chair Yoga poses will be specifically demonstrated. Also, they will share details on the two types of yoga classes that may be offered at the library if there is enough interest! This event is open to all skill levels, but is specially designed for absolute beginners, so please register early. Only those who register will be accepted as a confirmed reservation. Register by calling the Laflin Library at 570-654-3323. My friend, and fellow Yoga teacher, Lisa Galico and I shared our knowledge of yoga and its benefits on the pavillion at Newberry Estates! We had a great turnout and almost everyone signed up for either Beginner Yoga class or Chair Yoga class. We raffled off a huge basket of yoga goodies, and also some smaller prizes as well. A huge Thank You to Maria and Lynne from the Newberry Office for everything they did to help make this night a great success. The Dallas Post newspaper folks were there doing interviews and taking pictures for an upcoming article. Yoga classes will be held outdoors on the pavillion beginning in June (see Current Classes page for the Beginner Yoga dates). There is a 10 student maximum for Beginner Yoga, so please hurry if you plan on joining us! Only those who submit payment will be accepted as a confirmed student for the class. Make your $60 check payable to Newberry Estates (570-675-5236). 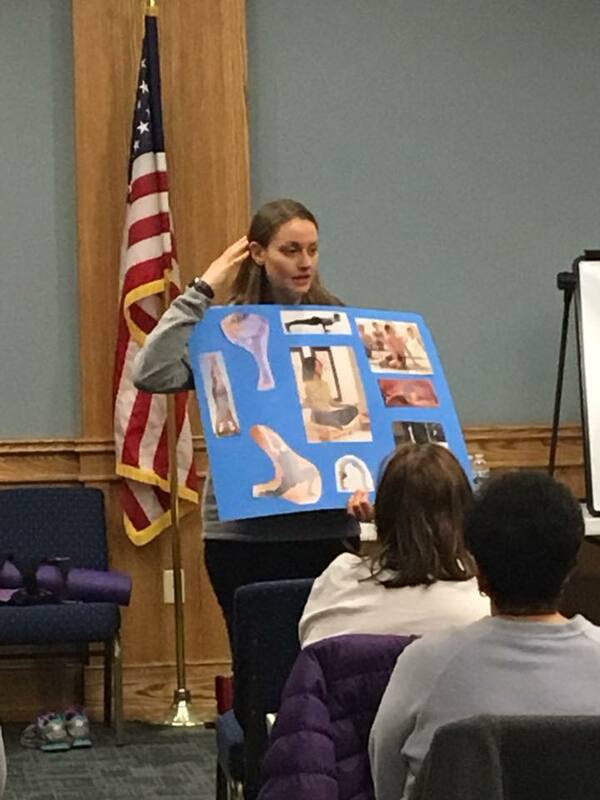 My friend, and fellow Yoga teacher, Lisa Galico (lgyogi.com) and I shared our knowledge of yoga with the M.S Support Group during their monthly meeting in February. 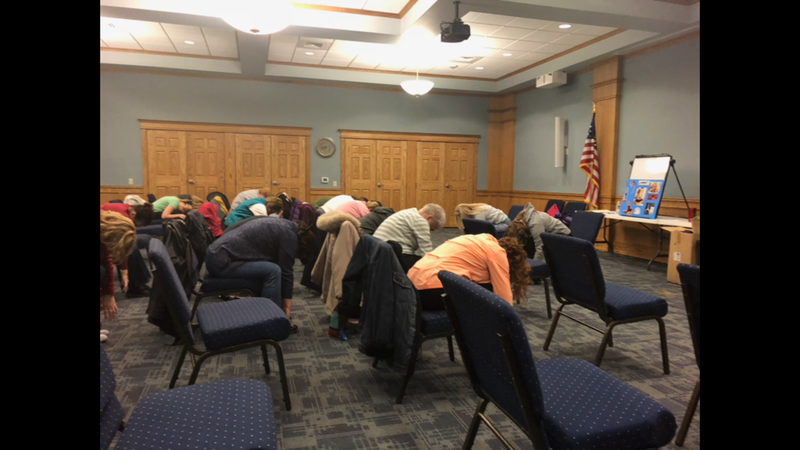 We were able to show them how to adapt physical yoga movements to help with strength and flexibility, and how breath-work and meditation can engage their parasympathetic nervous system to calm the system and reduce anxiety. A big thank you to this wonderful group for warmly receiving us, and we look forward to seeing you again in the future! My friend, and fellow Yoga teacher, Lisa Galico (lgyogi.com) and I together facilitated this wonderful and fun event! We had a great turnout and demonstrated various types of yoga, discussed the benefits of yoga and meditation, and answered lots of questions. 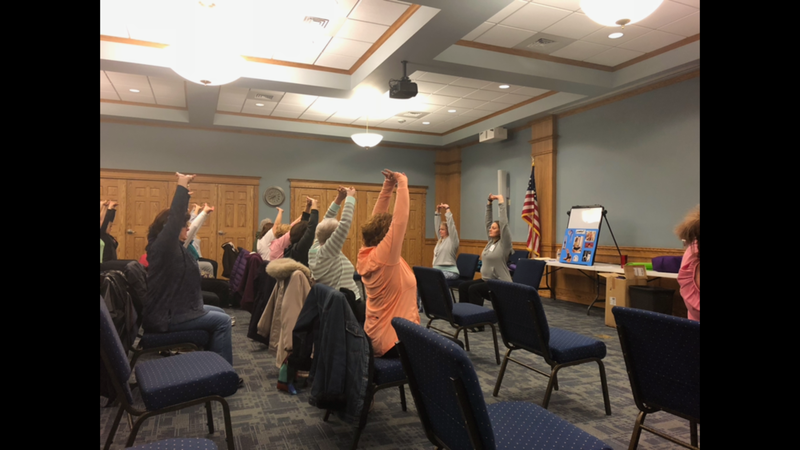 Each attendee received a FREE class pass to Unity in the Community yoga center (Pittston), and a FREE class pass to Home Barre Yoga (Pittston), as well. 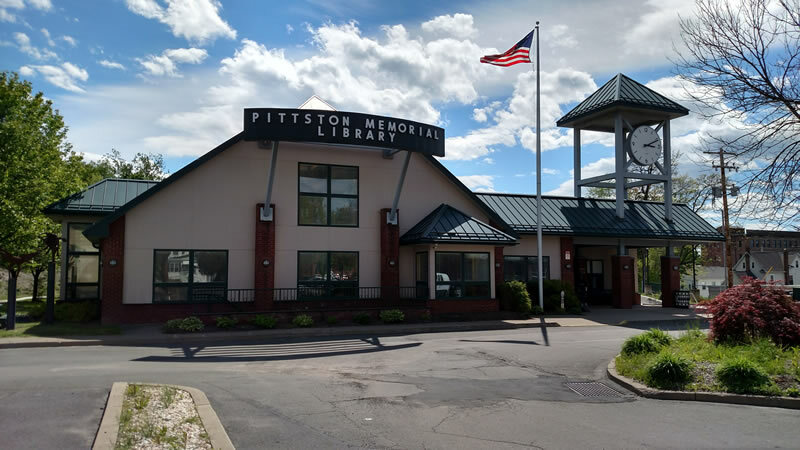 Many thanks to the Pittston Library for hosting us! Sign-up below to stay informed on all of our events!